Prins T.G., Reuter J.H., Debrot A.O., Wattel J. & Nijman V. 2009. 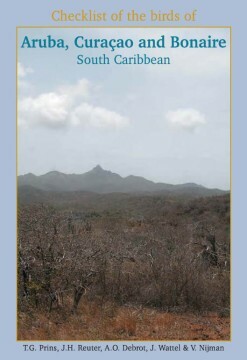 Checklist of the birds of Aruba, Cura�ao and Bonaire, South Caribbean. Ardea 97(2): 137�268. 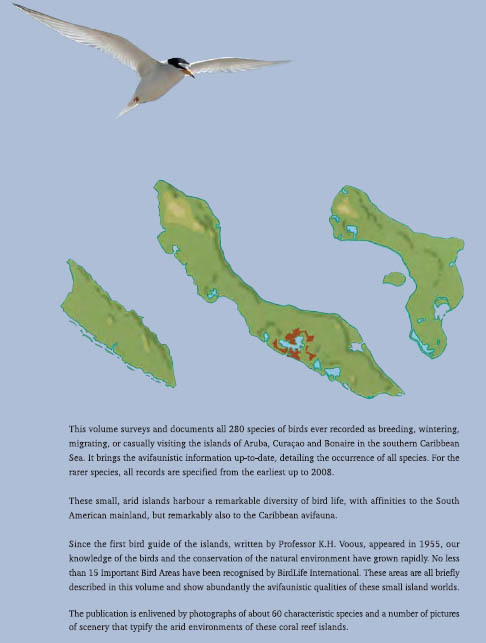 This volume surveys and documents all 280 species of birds ever recorded as breeding, wintering, migrating, or casually visiting the islands of Aruba, Cura�ao and Bonaire in the southern Caribbean Sea. It brings the avifaunistic information up-to-date, detailing the occurrence of all species. For the rarer species, all records are specified from the earliest up to 2008. These small, arid islands harbour a remarkable diversity of bird life, with affinities to the South American mainland, but remarkably also to the Caribbean avifauna. Since the first bird guide of the islands, written by Professor K.H. Voous, appeared in 1955, our knowledge of the birds and the conservation of the natural environment have grown rapidly. No less than 15 Important Bird Areas have been recognised by BirdLife International. These areas are all briefly described in this volume and show abundantly the avifaunistic qualities of these small island worlds. The publication is enlivened by photographs of about 60 characteristic species and a number of pictures of scenery that typify the arid environments of these coral reef islands. Special issues can be ordered by sending an email to: ekko.diny@planet.nl (mentioning the number of copies requested, your address and preferred way of paying). For any questions please consult ekko.diny@planet.nl. After sending an email, payment can be made by credit card or to our account: ING bank account 125347 to the Netherlands Ornithologist Union, van Stuivenbergweg 4, 6644 AB Ewijk, The Netherlands (BIC: PSTBNL21, IBAN: NL65PSTB0000125347). Check here if subscription to Ardea is rewarding for you (new subscribers receive the latest special issue for free).